Is there a better alternative to HVC Color Composer? Is HVC Color Composer really the best app in Plugins category? 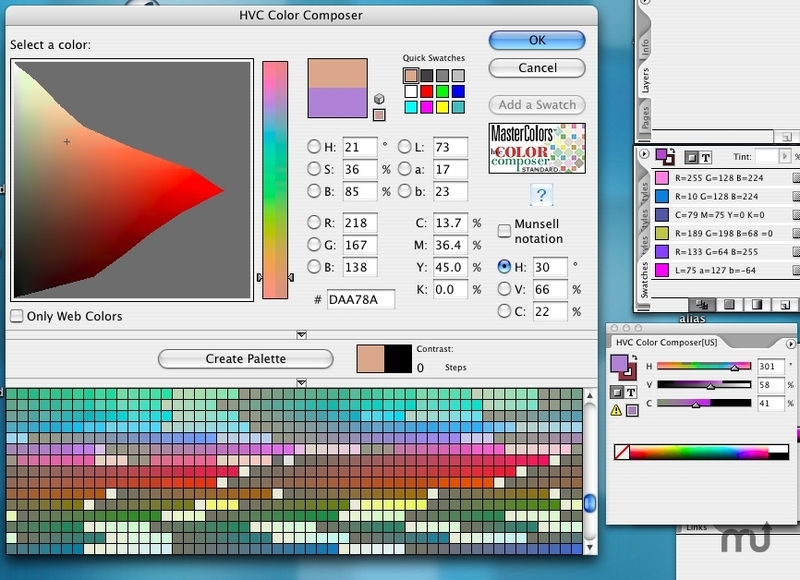 Will HVC Color Composer work good on macOS 10.13.4? The HVC Color Composer is an award winning plug-in for InDesign. With Master Colors Color Quantification Technology and unique HVC Color Space artists can now select parameters and create palettes of colors that have mathematically harmonious relationships to one another. The increased speed, efficiency and creativity are remarkable. What are you adding to InDesign with HVC Color Composer? This product is an enhanced version of InDesign's color picking system. Version 1.3.3 ¬: Release notes were unavailable when this listing was updated. HVC Color Composer needs a review. Be the first to review this app and get the discussion started! HVC Color Composer needs a rating. Be the first to rate this app and get the discussion started! This includes a new color panel (also called a "widget") which is always visible while you work on the document, and a new color picker which is accessible from the panel. You can always use InDesign's native color controls along with the HVC Color Composer the new features added to the panel are new color spaces, specifically the widely-used HSB space, and Master Colors' own HVC color space. Additionally, custom "split sliders are available for more advanced color navigation. The biggest addition to the picker is the Master Colors' Perceptual HVC Space. This is a new color space, resting along side the other spaces accessible through InDesign. HVC (Hue, Value, and Chroma) is a far more intuitive, perceptually-oriented space than the others available in InDesign. Spaces like RGB are just not suited for creative use. The human mind is not accustomed to considering color in quantities of red, green and blue light. There are many visual distortions in RGB as well. CMYK, Lab, both have their uses, but accommodating the creative process is not one of them. HVC provides fully distortion-free clarity to color selection, and this clarity is now available inside your copy of InDesign. By clicking the "H" (Hue) radio button, we view the HVC space by hue slices, and navigate the hue axis with the vertical slider. The logic is exactly the same in the basic InDesign color picker. By clicking the "V" (Value) radio, we view HVC by value slices. Value is a color lightness property. With this, we view all colors of a certain lightness at once. And the "C" (Chroma) radio button is selected. We view all colors of a certain intensity at once. Aside from navigating through the HVC space and using it to pick colors, there is another important feature of HVC Color Composer. It gives you the ability to generate dynamic palettes based on color contrast relationships. 2.Click "Create Palette" to make a palette that "works" with that color. The resulting palette contains an array of colors that have a mathematical, harmonic relationship to your target color. The palettes that are generated are very unique, vibrant, interesting arrays of color that you would not be able to find using any other methods, not even by flipping through professional design swatch or palette books. Yet, the palettes have actual significance to your own work. You chose the starting colors, and now you know the exact relationship between your colors of importance and all the palette colors. There is rhyme and reason to the palette's existence. It fits into a game plan, a greater vision of color selection for your personal work. That's something a static, prefab palette could never accomplish.